This here is Bucky Whites. He claims to be a cousin of Allen and Monte. We are not all that sure about that, but Bucky ’s claim was one of the driving forces behind getting Monte interested in genealogy research. Monte still has not been able to pinpoint what branch of the family tree Bucky fell off of. But, as anyone who has gotten to know Bucky can attest, he is really a gift to us all. First off, he teaches us once again not to judge people by their appearance. Underneath all his glitz and glamour is really an all around great fellow. Bucky’s Mom, Pearly Whites, has had more than her share of health problems recently. To see the way Bucky has been looking out for her is almost enough to make your heart burst! He is really a good guy. You can see he’s wearing a wedding ring here. We have never met his wife or even heard about her. Some think that the ring is a protection device that Bucky uses to keep the ladies from pursuing him. The truth of it is that Bucky is such a great banjo player and loves to pick so much that, except for his Mom, we don’t think a gal or any other interest could get in the way of Bucky picking a tune. It’s hard to even get Bucky to eat! Bucky Whites his own self has picked out these here banjos and he recommends them if you're looking for a good banjo to play while you're waiting for your Hendricks custom banjo. They also make great gifts for the banjo student in every family. All instruments shown here have been "picked" by Bucky and work just fine. Interested in owning one of these? Just give Bucky a holler! There are multiple audio sound bites of Allen's playing with different musicians. Several pictures with Allen and friends (and some of Monte too!). Information on his teaching and a up coming events schedule. 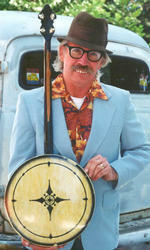 And very soon (this is November 2, 2012) to add banjos Allen and his students have for sale.